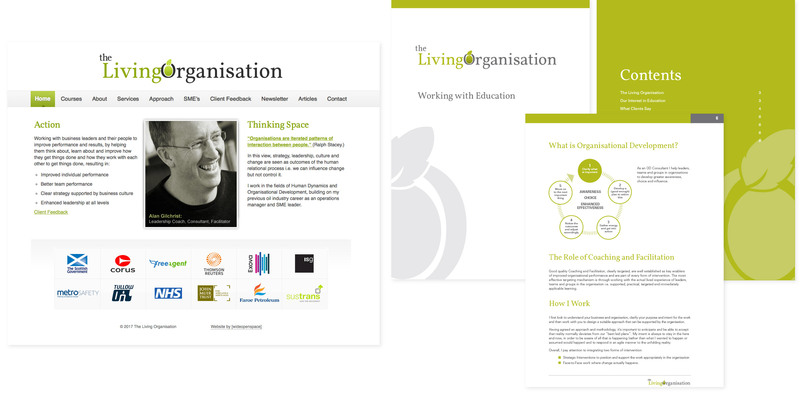 A simple website and print materials to promote the work of Alan Gilchrist and his company The Living Organisation, a professional consultancy specialising in human dynamics and organisational development. Engaging with Alan, whether it be on a one-to-one basis or working with teams, is more than simply business. In a crowded marketplace where similar organisations typically promote themselves with cliché images of consultants in dark suits, we took an alternative approach to highlight Alan’s approachable and friendly nature – an essential quality as an organisational development consultant. Wideopenspace also supports Alan in the production of tender and project report documents.